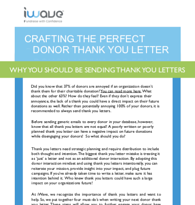 Get ready to learn the best strategies for writing the perfect donor thank you letter! Did you know that 37% of donors are annoyed if an organization doesn’t thank them for their charitable donation? This is a great time to ask yourself - are we sending thank you letters? We put together this easy-to-follow document to ensure you're thank you letters are always perfect!